"Jeff Mariotte has written a compelling heroine in banker Jessie Dawn Cutler, whose well-ordered world implodes when she witnesses a cold-blooded killing by her biggest client. Now Jessie must pit her courage and resourcefulness against a remorseless killer whose reach is limitless. In this heart-pounding thriller set against the glittering backdrop of international banking, Jessie must hold her own against tremendous odds to survive. 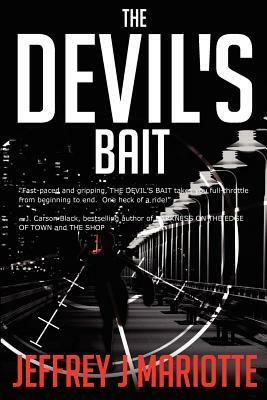 "Fast-paced and gripping, THE DEVIL'S BAIT takes you full-throttle from beginning to end. One heck of a ride " -J. Carson Black, bestselling author of DARKNESS ON THE EDGE OF TOWN and THE SHOP. Bestselling author J. Carson Black (The Shop, Darkness at the Edge of Town) wrote: "Jeffrey J. Mariotte has written a compelling heroine in banker Jessie Dawn Cutler, whose well-ordered world implodes when she witnesses a cold-blooded killing by her biggest client. Now Jessie must pit her courage and resourcefulness against a remorseless killer whose reach is limitless. In this heart-pounding thriller set against the glittering backdrop of international banking, Jessie must hold her own against tremendous odds to survive."